One of the great things about our product relationships with our customers and partners is that they allow us to invest in improving specified areas. We provide products that allow our customers to file individual bug fixes, and get an SLA (Service-level Agreement) to have an engineer start work on a problem; but while this focuses our work rapidly on exactly what a customer wants improving and delivering a fix to them fast – it can give a somewhat piece-meal result. Product customers, in contrast, allow us to tackle larger areas that they’ve experienced problems in. 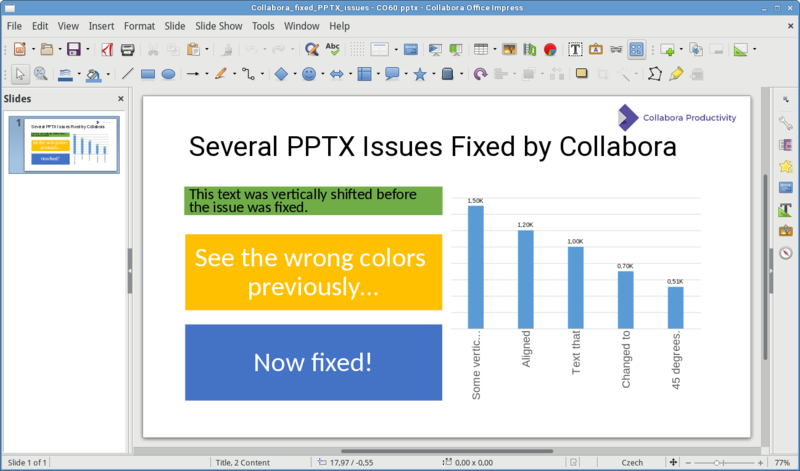 In our recent release (Collabora Office 6.0 and also back-ported to Collabora Office 5.3, and in the forthcoming community LibreOffice 6.1 release) we have had a chance to invest in significantly improving our OpenXML PowerPoint (PPTX) interoperability. In the past, occasionally when we saved a file in PPTX format, Microsoft Office warned of problems with the document on load. We investigated why that was happening and it turned out that LibreOffice was missing PPTX export code for many important features – like the export of group shapes (all shapes were exported without grouping), export of embedded videos, and preservation of customXML on export. We implemented all of these. 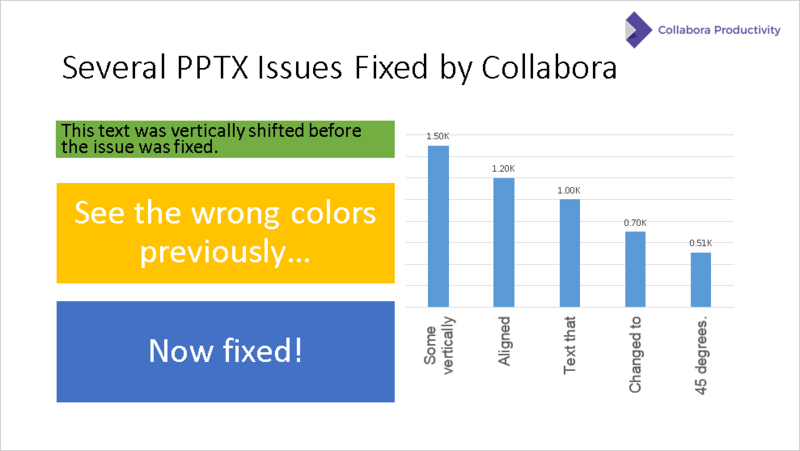 Another huge missing hole was handling of PPTM files (PPTX with macros), including preservation of the VBA stream on export – now Collabora Office and LibreOffice 6.1 can do it too. We also had a chance to fix a number of other important issues around animations (which are hard to see), like the implementation of animation type Command, Motion or Spin. In common with all other implementations trying to inter-operate with Microsoft, there are corner-cases where interoperability still needs improvement – but it is encouraging to see the significant reduction in easy annoyances here, and the results of improved rendering. 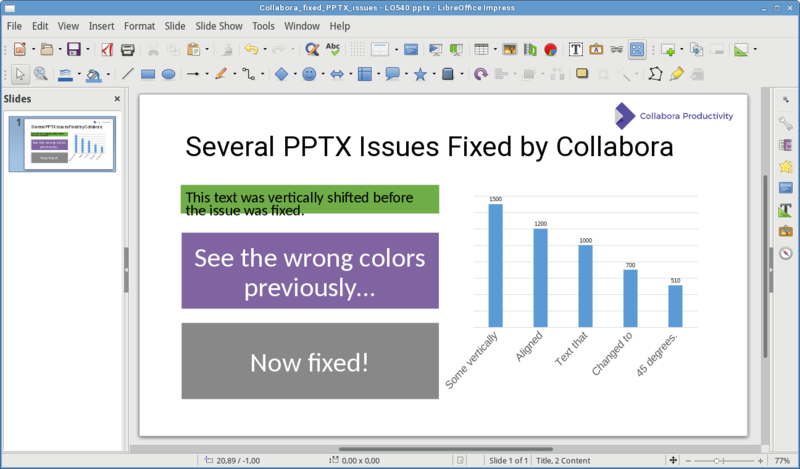 Download Trial version of Collabora Office 6.0!